We all know the Google Chrome is one of the best and most popular web browser for computer and mobile too. And why not? It is a best as it provides much-advanced features for all the users. And today we are going to deal with one of the best features Google Chrome shows the warning "This site ahead contains harmful programs" error to users when they wanted to visit a particular website which shows the message in red background about "PHISHING ATTACK" or "Malicious content" or malware alerts like "DISTRIBUTING MALWARE" or even if the website was hacked. It's all about "Phishing Attack Ahead" - we know this warning from Google Chrome is the best features for all the users but its very annoying for the website owners or developers, webmaster. It prevents the site visitors to visit your site which causes the negative effect on the website traffic. Your website traffic suddenly goes down and drastically falls below 10%. As site visits fall, your revenue also falls and then you started to search for the issue of "This Site Ahead Contains Harmful Programs/Malware"
The warning from chrome browser; the website ahead contains malware indicates that the website you want to open and visit might try to install nasty software, named malware, on your system. Moreover, if you see the warning of the "deceptive site ahead" that means the website you are visiting might be a phishing site. Such website ahead contains harmful programs that might cause furthermore trouble to the system owner so the chrome is performing better for you. But as a web developer, you get known that later; it is all about the malware alert shown by Google Chrome. There is an option to stop Chrome warning - "The Website Ahead Contains Malware" and to disable the malware detection warning in Chrome, but IT'S NOT A PERFECT SOLUTION. We need a proper solution which passes through Google security. 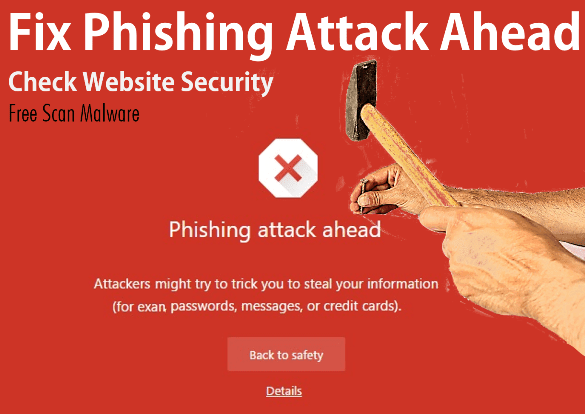 Learn how to remove phishing attack ahead warning and fix the site ahead contains harmful programs from Google Chrome and prevents the Google Chrome to show a phishing attack ahead message on a URL. Last time we saw; MOBILE SECURITY - Track Your Lost or Stolen Android Phone | Best Android Tracking App and today we are going to see much details and solution about fixing Google Chrome security warnings from webmaster's point of view. 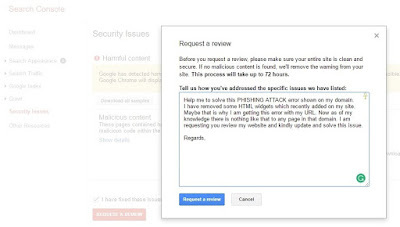 Solve "This Site Ahead Contains Harmful Programs/Malware"
Fix "Phishing Attack Ahead" Error - Last week, the Google safe browsing detected phishing on one of my websites and showing attacked by 'Phishing Attack' warning and suddenly the all the visits per day fall near to bottom line. But then I got to know that it's all about the Google Chrome security warnings that showing to each visitor which preventing all the readers to visit my site. Now I am going to share all the things with you that I did to remove that danger red phishing attack screen shows about 'Malware Ahead' or 'Phishing Attack Ahead' message and any malware, phishing warnings from Google Chrome. Attackers on [www.yourwebsite.com] might try to trick you to steal your information (for example, passwords, messages, or credit cards). Google Safe Browsing recently detected phishing on [www.yourwebsite.com]. Phishing sites pretend to be other websites to trick you. If you understand the risks to your security, you may visit this infected site. Step 2: Also, you may need to clean and remove all the recent changes you made. Pages like the sample URLs shown led to harmful downloads or contained code that directed the browser to malware, unwanted software, or social engineering content. The source of the harmful content may be embedded ads or other third-party content on these URLs. Unfortunately, the malicious code within the page could not be isolated. Step 6: Just check all the URLs. And request for a review. Step 7: Click on 'REQUEST A REVIEW'. Step 8: It will take 72 hours to complete the full review of your site and take an action to work. You will also receive the confirmation mail from the Google about a successful review. No need to take tension, trust me, if you DID NOT make any wrong action, your problem should get solved successfully. Let me know about your issue and if you think this page is helped you then don't forget to share and like on Facebook. Moreover, if you know any better solution than this, then you can share it with us via comment section shown below.